Join Alicia's Monthly Newsletter Mailing List to be informed when new pieces are available! ARTdornments are a culmination of everything that makes my soul sing, and I'm thrilled to share my creations with you! I've combined my passion for parrots and animals, an addiction to polymer clay, and a deep adoration for the romance and artistry of days past, into a unique line of creative jewelry! Each one-of-a-kind pendant is hand made from polymer clay, treated with metallic pigments and aged, all while paying tribute to the little works of art that are encased under glass within. 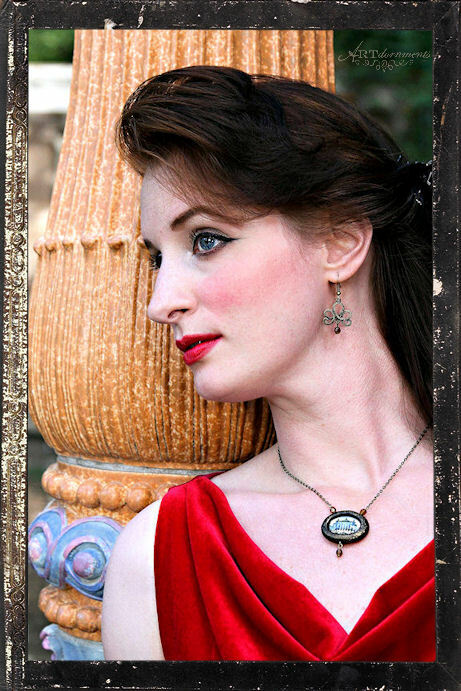 Semi-precious stones, shimmering glass beads, and antiqued findings complete the jewelry. Each pendant highlights a special image from the past, with it's own truly unique story. ARTdornments celebrate the beauty found in Nature, Ornithology, Fantasy and Folklore, Architecture, as well as the special connection between humans with their animal and avian friends. My inspiration comes from many time periods including the influence of Victorian, Edwardian, Art Nouveau, Renaissance and Medieval eras, with a particular fondness towards Pre-Raphaelite art. Above all, ARTdornments are created with love, with the intention of sharing beauty and joy in a miniature art form that will not only adorn your physical body, but uplift your spirit as you look at them ~ and most especially when you wear them!